The iconic green alligator (or is it a crocodile? I haven’t a clue!) appliqued to all manners of tennis clothing is synonymous with the brand Lacoste. I’ve never taken much interest in the brand because I have little interest in overpriced white cotton polo shirts; nonetheless, my eyes did widen upon reading that the French company was participating in a transformative design charette with an architect in Pittsburgh. 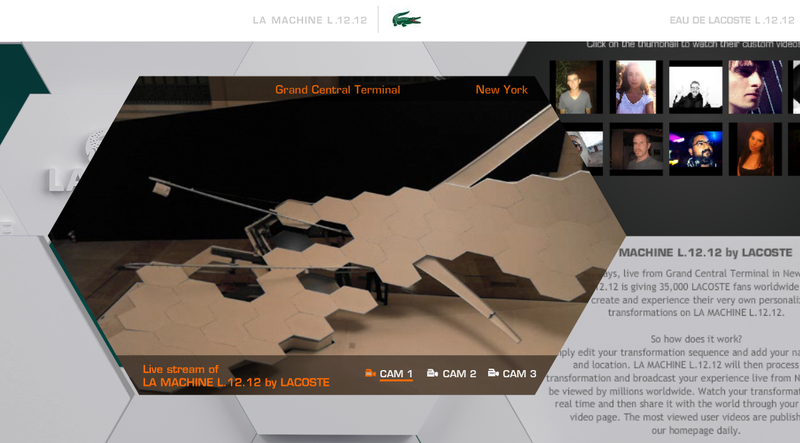 The buzz generated around Lacoste’s La Machine L.12.12, positioned in NYC’s Grand Central Station, owes much to the fact that it was shroud in secrecy – save fragmented clips of fly-through renderings and participant interviews. What was this ‘machine’ I wondered? An animatronic, life size reptile? Nope. A holograph of Rene Lacoste from 1933? Nope. A grouping of polygons imitating the gravity-less world of computer modeling masquerading as a projection screen? Bullseye. A few days prior to the September 19th launch of the faceted screen I voluntarily handed over my email address to be updated about, well, I didn’t really know, something about the machine. Here’s what I discovered: the machine, pictured above, in a screenshot from the live feed on the project’s website, circa Friday afternoon, is an obtuse gathering of polygons curving towards the ornate ceiling of Grand Central. There are also four strange looking appendages (maybe this is supposed to be an animal!!? ), two of which act as conveyor belts while the other two look like hands on a clock. Puzzling. On this, 20 second long movies are projected. These movies are “created” (you’ll see why the word is in quotations in a sec) by users on the website who crave what the brand advertises as “fame”. Having nothing against fame, I decided to check it out. While I waited for my opportunity to load, I read some more on La Machine’s homepage: “L.12.12 will be influenced by the options you select and personalize your experience based on your choices”. How fun! The vague but enticing description reminded me of an event in the Czech Pavilion at the World Expo last year where somehow my brain waves were translated into a grandmotherly smelling fragrance via an iPad. Strange, I know! 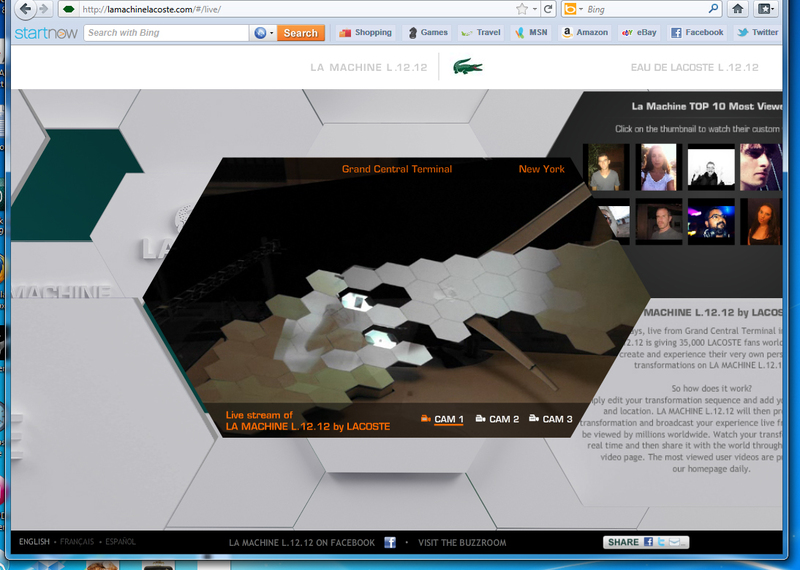 With Lacoste, I expected a video game-like platform; instead, I was greeted with a set of super lame choices. Step One: choose a color shirt based on your mood. The choices are green, white and blue. I didn’t much like the hues of the green or blue shirts, but as hovering over the option of white revealed that by choosing this I was saying my mood was “pure”, I decided to chose the “powerful” blue despite the shade. Step Two: choose a “scenario”, which was much like saying, choose whether you’d like your screensaver to look like the default Macintosh or Windows PC version. Or one with kites. Step Three: chose one of four versions of the alligator/crocodile; depending on which Photoshop filter effect is your favorite, presumably. Step Four: pick an avatar or upload a photo. This is the only possible chance you have do something remotely original. And didn’t you always want your Facebook profile pic floating around Grand Central? Seriously Lacoste? Seriously to anyone involved on this project? Seriously to the hundred or so people (mostly from Europe, so forgive them their fascination with visiting the United States, if only virtually) who have completed this experience? The brand is not new to social media-esque ventures and is not shy when it comes to internet promotions. This, is just a new level of uninteresting. And perhaps it is not going as well as planned, guessing from the people looming in the background of the live feed who appear to be performing maintenance on this machine (on Saturday’s feed the conveyor belts were moving but there were not videos, see above). Lacoste probably thinks I am in love with this project, after all I’ve hit the site at least five times in the past few days to see what, if anything, has transformed. I’m still eager to see how this beast turns into a perfume; but, becoming increasingly less interested as time stretches on and all I see are reptiles and screen savers and Wii-like avatars. Disappointing at best. Next time a clothing company wants to incorporate architecture into a product line, they should do so more in the lines of Zaha Hadid’s Chanel Mobile-Art Pavilion. Now there’s high art and architecture! I’ve decided to get more of my news from your blog….. you are hilarious! !